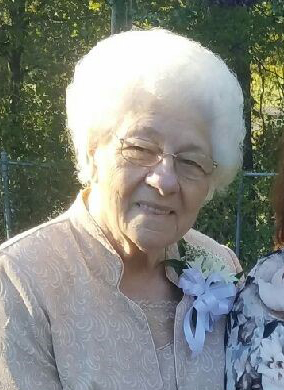 Geraldine Humphrey Ginn, 81, passed away Sunday, November 18, 2018. She is preceded in death by her husband Robert Carroll Ginn of the home and parents Marcellus Humphrey and Letha Horne; sister Maxine Coombs; brothers Marion Humphrey and Elwood Humphrey and Harold Humphrey and grandchildren Matt Ginn and Marcy Ginn. Survivors include her daughters Patsy Ann Ginn of Kinston and Kathy Ginn Bridgers of Ayden; sons Robert Carroll Ginn of Clayton, Morris Ray Ginn and wife Carolyn of Greenville and Jeffery Floyd Ginn and wife Donna of Greenville. sister Thearine Starling of Turkey; brothers Julian Humphrey and wife Letha Mae of Farmville, Morris Lee Humphrey of Richlands and Marshall Ward Humphrey and wife Laureta of Wilmington; grandchildren Bobby Ginn of Clayton, David Ginn of Texas, Brandon Jones of Pennsylvania, Dana Lane of Kinston, Alex Gardner of Kinston, Roxanne Bridgers of Ayden and Dustin Kane Herring of Ayden and six great-grandchildren. A funeral service will be held on Tuesday, November 20, 2018 at 7:00 p.m. at Rivermont Holiness Church 5119 Hwy 258 S., Kinston, NC beside Woodington Middle School with Rev. Jimmy Horne officiating. Visitation will follow the service. Graveside service will be held on Wednesday, November 21, 2018 at 11:00 a.m. at Snow Hill Cemetery. In lieu of flowers memorials may be made to Rivermont Holiness Church 5119 Hwy 258 S Kinston, NC 28504.